There are differing views amongst Car Historians as to whether Old Number One was the original and first MG built. MGs were built for some two years before Old Number One came on the scene. It is certainly true that this vehicle was the first MG to be built specifically to compete in sporting events. The first cars known MGs were in fact special bodied Morris Cowleys. Old Number One was first seen at the 1925 Lands End Trial. 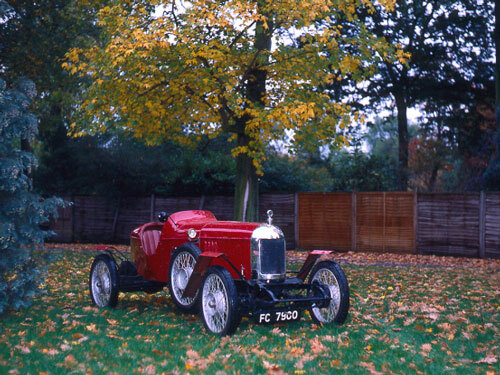 Cecil Kimber had the car specially built to compete in the trial and this was indeed based on a bullnose Morris Cowley chassis. The rear section was modified, the chassis frame being cut off and having new rails fitted which curved up and over the rear axle to secure splayed rear springs. The engine was a special overhead valve Hotchkiss with a capacity of 1548cc. Tuning amounted to machining and polishing the cylinder head and minor carburation modifications. The 11.9 hp engine was then linked to the standard Morris transmission employing a 3 speed manual gearbox. Fuel was introduced to the SU carburettor by a hand operated air pressure pump located next to the gear lever. The suspension arrangements used a standard half elliptic spring at the front, but with special half elliptic rear springs in place of the normal Morris three quarter elliptic. Tall wire spoke wheels were fitted to the standard hubs by three bolts, braking was standard Morris drum system, both front and rear. The only lighting on the car was by two small sidelights mounted on each side of the scuttle and a single headlight which is not evident on the car today. The normally high Cowley steering column was lowered by raking the column. Extra instrumentation included a tachometer, fuel and oil pressure gauges along with the standard speedometer and ammeter. The special lightweight body was designed and built by Carbodies of Coventry for Kimber, the final assembly of the car was at the Morris factory in Longwall. Oxford and it was originally registered FC 7900 on 27th March 1925 (a new number FMO 842 was allocated in March 1950 after a restoration, however in 1959 the car was re-united with the original registration of FC 7900). Kimber competed very successfully in the Lands End Trial that year, winning a Gold medal in the Light Car Class. Soon after the Trial the car was sold to a friend of Cecil Kimber's for £300. It was reputed to have only cost £279 to build and is now valued at a figure approaching £250,000 (who says MG's are not an appreciating asset!). Old Number One was later spotted being used to haul a pig food trailer of all things and subsequently discovered in a Manchester scrap yard by an employee of the MG Car Company in 1932 and bought for £15. The car was then taken to the Abingdon factory and restored to be used as a promotion vehicle. The Nuffield Organisation were the first to adopt the title Old Number One when they utilised the car in advertising and publicity material for the MG Car Company and the title has remained ever since. When the car was restored by the factory the colour was changed from the original grey primer to the colour it is today, cherry red. The car has always featured well in MG publicity material and has been exhibited on numerous occasions at home and also abroad, on one occasion it was shipped to the USA to feature in the 50th anniversary celebrations of MG. The car now forms part of the British Motor Industry Heritage Trust Collection at Gaydon, where it is generally on permanent display. It is kept in full running order and indeed throughout its life many privileged journalists, historians and enthusiasts have been allowed to drive the car to assess the merits of the car that helped fuel the tremendous following that the marque now enjoys worldwide.